Targeting Germany has become a Trump delight as he complains about too many German cars on US streets; the cost of US troops based there; making false claims that crime is spiking in Germany because of immigration and relishes seeing “the people of Germany … turning against their leadership.” Now he’s turned his divide-and-rule tactics onto the German-Russian gas pipeline, as well as NATO spending. Germany derives under 20% of its energy from gas of which 60-70% comes from Russia, the rest from Norway; their use of gas will go up in future as they reduce dependence on coal and cut out nuclear altogether. Poland and other eastern European countries strongly object to the Russia pipeline since they see it as running the risk of destabilising their region and giving Russia too much influence. Stage two of the pipeline project would allow Russia to cut off gas supplies to Ukraine and disrupt many east European countries, while preserving Germany’s energy supply. Part of Trump’s German bugbear may be Merkel’s obvious distaste for his policies plus his mother issues being triggered by a stalwart Mutti. Though, heaven knows, he should be grateful to Deutsche Bank who hauled him out of financial trouble when he was blacklisted on Wall Street in the 1990s. Which may or may not become part of the Mueller investigation since Russian money laundering landed the bank in the soup with the US Justice Department. What will make a significant difference is Trump’s Pluto Midheaven running directly through Germany, which will bring out his desire to dominate, sneer, put down and equally will run him into resistance and resentment. That’s true for most of Europe and the UK but Germany is on the bullseye, especially Frankfurt where Deutsche Bank is situated. The Pluto MC line is usually regarded as risky either physically or in terms of undermining reputation – interesting to see if the money angle (more below) is his downfall (should it occur). There’s also hugely difficult chemistry between himself and Merkel personally with her 8th house Sun Uranus in Cancer conjunct his Saturn Venus; and her determined Pluto conjunct his Mars. His relationship chart with her is no better than his with Germany (1871) with strongly aspected Uranus (= no compromise) in both. November/December this year look like lowering the temperature still further. 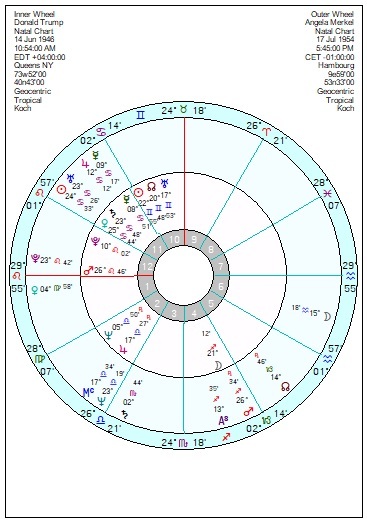 Trump’s Pluto Descendant runs through China making for a hostile relationship and struggle for the upper hand; and his successful Jupiter midheaven line runs through – no surprise – Russia, to the east of Moscow. Below isn’t astrological but gives context. 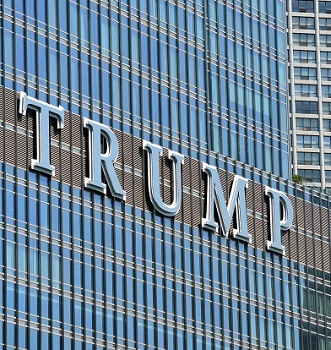 A Financial Times investigation into the Trump Toronto quotes a former Trump Organisation executive as saying “Donald doesn’t do due diligence.” So no checks would have been done in the post-Soviet rush to stash money abroad. Where Russia is concerned oligarchs, mobsters and the Kremlin are all intertwined and the likelihood of Putin having compromising information means he won’t even have to issue orders. Trump will proactively be doing whatever he believes will keep him in Putin’s good graces. The general view is that Putin didn’t directly plan to put Trump in the White House, nor did Trump expect to win which is why there’s been such a panic to cover tracks. And one day his DC vacation will end and he’ll want to keep his family’s business model intact for the what-comes-after. Follow the money. Britt I can’t see where your critical thinking is more like gullible. We can all express our thoughts without getting personal. I am a proud Virgo, emotion is fine but let’s have some critical thinking, proper analysis and logic added to the mix. Marjorie, you are at fault here because you encourage these petty and spiteful responses by the way you write you articles, leave out your bias and just present the astrological facts. Britt, I’m more than happy for you to offer alternative interpretations. Feel free to pitch them in. 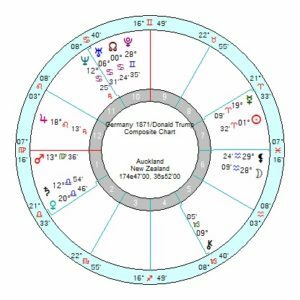 Donald Trump is right as he has Sun conjunct Uranus and Regulus on the ascendant? Is that your logic? My 8 year old has Regulus on the ascendant, perhaps we could put her in charge of American foreign policy? I look forward to your unbiased, proper analysis. Why should the US tax payer pay for the defence of Europe ? 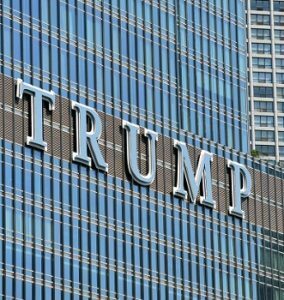 DJT Sun conjunct Uranus, Regulus on his ascendant doesn’t that mean anything to you ? This man will change the course of history wether you like it or not, remember the last person who came to this planet that the establishment hated with a vengeance and crucified? Go back to your history books. JFK and RR also tried to challenge the corruption at the heart of the US government and we all know how that ended and RR also nearly lost his life..
DJT is telling the world a few home truths about politics, business and money and you don’t like it. Luckily for DJT he is protected not by the Three letter agencies who would surely get rid of him, but by the two groups who report directly to the President, Military Intelligence and the Supreme Court. Separation of powers? The judiciary is – or should be – entirely independent of whatever president is parked in the White House. Which is what I recollect Gorsuch was quizzed on. Are you serious Britt? Comparing Trump with Jesus? You’ve crossed the line my dear. Trump may be making sense in certain areas but doing a lot of damage in others. What damage did Jesus do? I believe the concept of everyone pitching in one pot implies that all will go to the aid of the other who needs it. If you put this into perspective the USA pays one contribution that represents all of its states. Each of Europe’s states pay their own contribution. Therefore it makes sense that US would make a bigger contribution. That’s my simplistic take on all this. One day soon you’ll be mighty ashamed of this post. Jesus wouldn’t be allowed into the USA under Trump’s travel ban. Also I have a faint recollection from decades back of Christ upending the the money-changers and merchants’ stalls and railing against the greedy. Eye of a camel and all that. Well Germany ‘God’ just came to town and now he is in the UK. Also, I absolutely saw Trump accusing others of things he is doing when he said Germany is in hands of Russians. I would even say 70 per cent of his debt is from Russian sources. This is just how Narcissistic Personality Disorder people work. Yes re Russia. is the arch projector extraordinaire. It feels to me like an era of grotesque populist leaders with dictatorial inclinations. As if it’s Uranus in Taurus 1934-42 all over again. Mark my words, but going after Germany specifically could, and will, backfire on Trump “bigly”. Currently, very few things unify Europeans as much as dislike for Trump. In my country, only 6 per cent of people view him favorably, and that drops to 3 for women. Reading European press, Merkel does not usually gather sympathy points, but yesterday people were cheering her for telling Trump she actually had lived under Soviet Influence. Another thing I noticed was Italian media doing their best ignoring reporting Trump’s disapproval of Germany, possibly because they know it’s only a matter of time Trump comes for them and their actually shrinking Military Budget. … (continued) the spending will be directed to them and not US Military Industry, as Trump would like.